« After Two Years in the Forests of Central Congo. The congo peacock and the grey parrot are both in TL2 forests and, after two years, finally here is their first post. 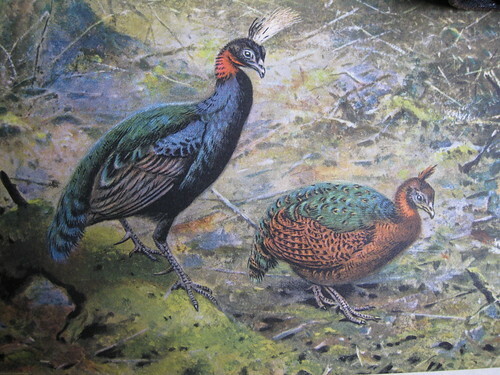 The Congo Peacock (Afropavo congensis) exists only in the forests of D.R. Congo. It should be emblazoned on national uniforms or pressed into official seals. Not so. We are more often reminded of its presence by charred remains by campfires. Killing Congo Peacock is not worth comment – it is only a bird. 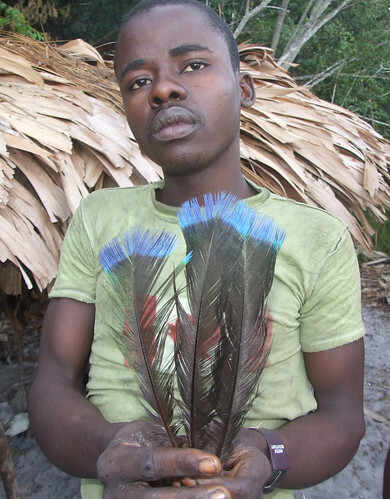 Hunter in TL2 holding the feathers of a Congo Peacock that he cooked the night before. Chapin, who was the first to describe Afropavo in 1936, said its closest relatives were the Asian peacocks. Many later disputed this, giving it closer connections to francolins or guinea fowl that are, after all, African. Not so – recent genetic studies agree with Chapin. Afropavo, unlike the more flamboyant Asian peacocks is monogamous with both male and female caring for a small clutch of young. Other than that, not much is known. This photo we found pasted onto the front endpaper of volumn 2 of “The Birds of the Belgian Congo” that we acquired. It was taken in the town that has become Kinshasa. “It may well be that in those areas (where it does not exist) it has been extirpated by native hunters.” (p627) We don’t know enough to confirm this. The frontispiece of the “Birds of the Belgian Congo” volume 2, published in 1939. Fidèle Amsini holder a poacher-killed Afropavo near Maiko National Park. They are caught in snares. Special barrier traps “lead” Afropavo and other mainly ground birds into the snares. Male and female Congo Peacock. Photos from Fidèle Amsini. 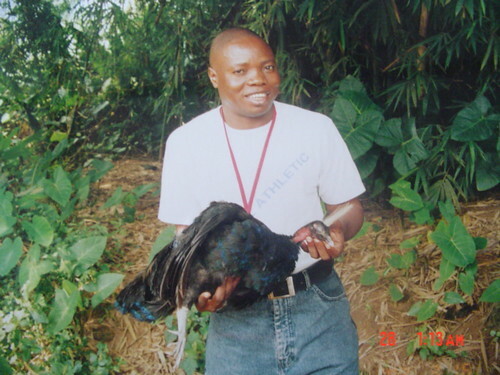 What gives the Congo Peacock its small margin of safety is that there is no specialized commercial market — in or outside of Congo; they are just meat for the pot. The grey parrot (Psittacus erithacus) , however, is in a very different situation. 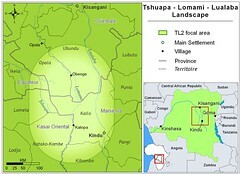 It has a large distribution, overflowing the borders of DRCongo into all the forested countries of Central Africa. But there is also a large market for living birds, both in Congo and in markets of far more developed countries. 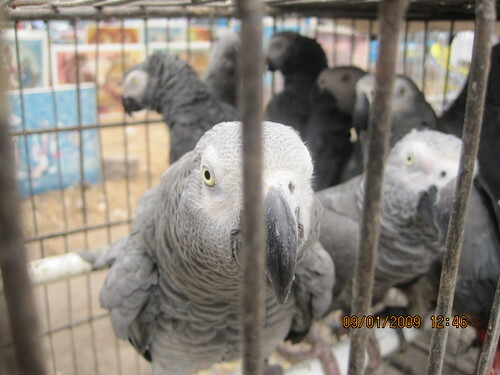 These grey parrots are for sale at the “marché des voleurs” in Kinshasa. Canvases of local painters are visible in the background. CITES (Convention on International Trade in Endangered Species) issued export permits in 2006 that included 10,000 living birds from DR Congo, 12,000 from Cameroon, 10,000 from Congo-Brazzaville, and 3000 from Ivory Coast. Alarm was eventually raised over the high mortality involved in the capture of parrots and the lack of real control over the number of birds exported. Nowhere was control less present than in DR Congo. In 2009 only DR Congo and Congo-Brazzaville still allow grey parrot exports, with the largest number, 5000, from DR Congo. What is the real number that leaves? What number is dead before it ever reaches a border. Many different methods of capture are used in Congo (see Roger Fotso’s study below). In TL2 we know of nest sites being watched and then the young stolen. But in the Equateur Province a glue produced from tree sap is used on the ground or in trees along with decoy birds. Nets are also used, being spread in mineral licks similar to green pigeon captures reported earlier. 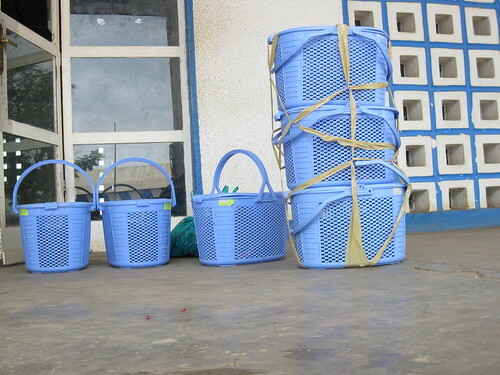 Greys being transported through the Kindu airport. There were six parrots to a basket. If the grey parrot has become so popular, from Long John Silver’s shoulder to many suburban sun rooms, it is because they are indeed good company. Alex, a famous grey parrot who lived to be 31, not only had a large vocabulary, but would engage in simple conversations and could make decisions based on verbal choices. 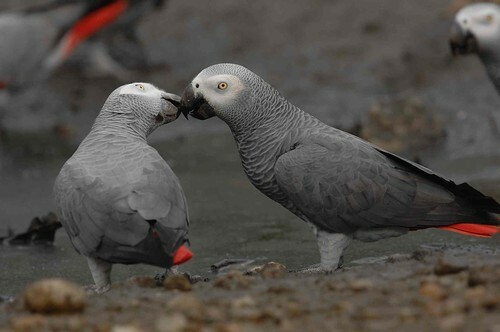 Now, many countries including the United States have strict rules to assure that all grey parrots sold be captive bred. It works. 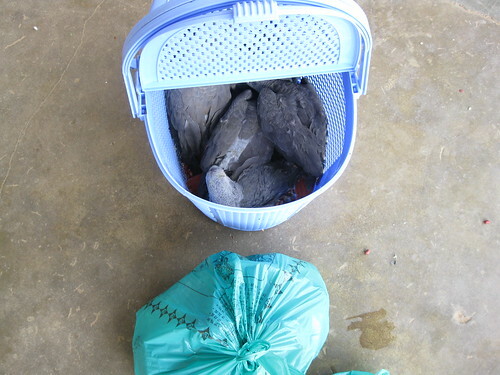 Stopping the trade in wild grey parrots would not interfere in any responsible pet trade. It should be stopped. 1954. 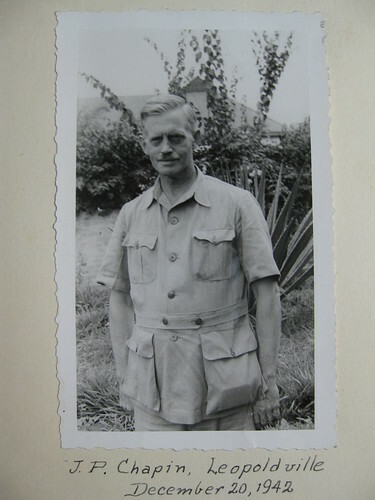 Chapin, James P The Birds of the Belgian Congo, Part 4. Bulletin of the American Museum of Natural History, Vol 75B NY 846pp. 1996. Fotso, R.C. Examen du statut, Etude de la distribution et de l’utilisation du perroquet gris (Psittacus erythacus), au Zaire. Rapport final. CITES secrétariat, Projet S-60. This entry was written by Terese Hart, posted on 2009-09-10 at 6:44 pm, filed under Bushmeat, Kindu. Bookmark the permalink. Follow any comments here with the RSS feed for this post. Post a comment or leave a trackback: Trackback URL. So all flagship species of DRC can be found in the TL2 landscape(bonobo.okapi,congo peacock) and the Grauers Gorilla is not far away. Grauer’s gorilla is across the Lualaba (congo) in Maiko national Park, Kahuzi National Park and Itombwe. The former two parks are partially in Maniema Province. I wish that all of this meant that it would be easy to develop a welcoming tourist environment. Nous une Ong qui s’occupent du développement et de la conservation de Biodiversité. Nous avons un projet sur l’Etude de la distribution et de l’utilisation du perroquet gris ( psittacus erithacus) . J’ai fait parti du projet S – 60 conduit par Dr Roger Fotso au zaire en 1996 pour le compte CITES. début juillet 2010 pour une durée de 60 jours.